Caribbean Shipping Journal is the only magazine that specifically serves the needs of the shipping and port industries in the Caribbean. First published in 1973 by the Caribbean Shipping Association as its official magazine, Caribbean Shipping Journal has been transformed into a professional trade journal with a unique regional focus. 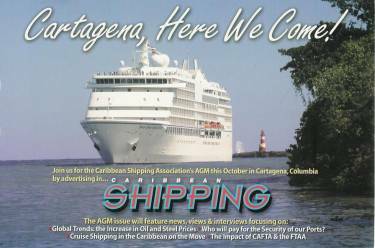 The magazine carries current reports and feature articles as well as the news of the Caribbean Shipping Association. Caribbean Shipping Journal is published in October and circulated to key individuals, companies and governmental bodies concerned with all aspects of shipping in the region and to subscribers worldwide. Clients: Login to your account or contact MNI for current rates. Agents: Please Login to your account. Bleed Page (allow 1/8 for bleed) 8 1/2" 11"
Full Page 7 1/2" 10"
1/2 Page Vertical 3 1/2" 10"
1/3 Page Square 5" 5"
1/3 Page Vertical 2 1/2" 10"
1/4 Page 3 3/4" 5"
Caribbean Shipping uses computer-to-plate technology, therefore, no film output used. All material must be supplied in electronic format, NO FILM! It may be sent via email or placed on a CD, JAZ 1/2GB or ZIP-100 media. A full colour proof must be sent separately if artwork is emailed, or included with disc media. Caribbean Shipping will not be responsible for colour reproduction or loss of data if a colour proof is not in hand. A JPEG file at 300dpi resolution or PDF files are best for emailing. Consult your programmers directly for converting all vector and pagination files to CMYK files. Remember to use proper compression ration for best quality. Convert all vector and pagination files to CMYK, TIFF or PDF files. A TIFF at 300dpi resolution or a PDF at 2400dpi will ensure high resolution.